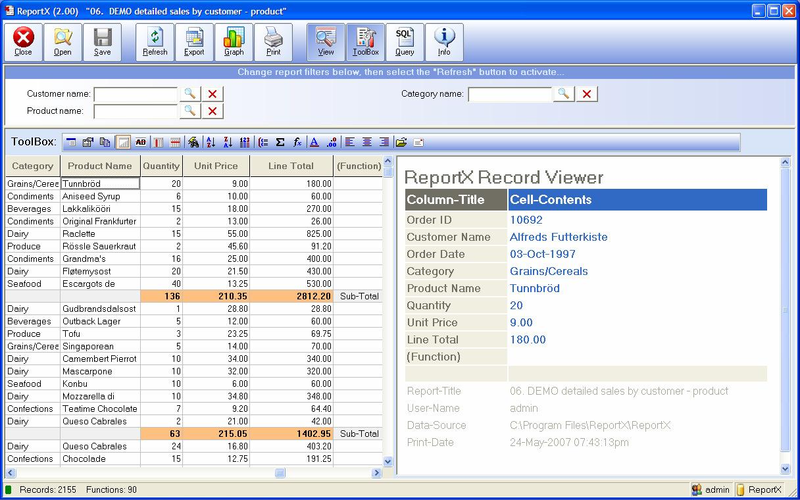 An industrial strength software product that provides a generic interface for viewing, printing and managing crystal reports templates. Because it is bundled with the crystal reports print engine, you do not need to install crystal reports on the user's machine. ReportX can be used as stand alone program with its own repository Or in a multi user network environment with a copy of ReportX running on each user's PC and pointing to a central report repository. ReportXmanages this central repository. Now Organizations can just acquire report templates and neither worry about the high cost of developing GUI applications to use these templates, nor worry about such things as access security to reports,reports location and version management. Developers and report writers can just design crystal templates and not worry about the user interface for viewing and printing them.